There are many wonderful books about Catholic saints available. Most of you probably own some of them. Perhaps you even have some collecting dust in your home. They looked so interesting, but you never found the time to read them. So, why should you purchase another one? 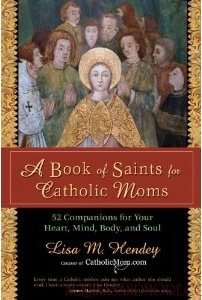 Because in the new A Book of Saints for Catholic Moms, Lisa Hendey has put together a very inspiring, practical guide to the saints designed especially for Catholic mothers. Hendey, the founder of CatholicMom.com, wrote this book as the follow-up to her bestselling The Handbook for Catholic Moms. In that book, she focused on the “importance of nurturing ourselves as moms in four components of our lives: heart, mind, body, and soul.” In this resource, she has profiled 52 saints and highlighted which of those four components they speak to in our lives. This book can be used on a week by week basis with the focus being on one saint per week, or one may simply wish to focus on a saint that speaks to whatever area of one’s life is in need of a little extra help at the moment.